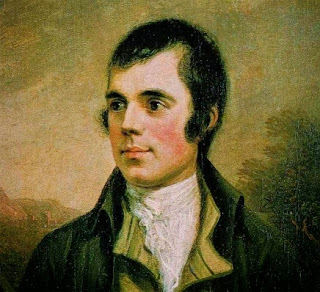 Every year on January 25th, millions of people (mainly in Scotland and Northern Ireland) join together to celebrate the life and work of the Scottish poet, Robert Burns. Born in Alloway in 1759, Robert Burns is regarded as not just the national poet of a Scotland, but a national treasure too. He wrote literally hundreds of poems and songs in the Scottish dialect, the most famous of which are Tam O’ Shanter, To A Mouse, and of course, Auld Lang Syne. The Burns supper is a gathering of friends which can be either formal or informal. Celebrations begin by piping in the guests to the sound of bagpipes. This music usually comes from live musicians at larger, more formal ceremonies, but a CD is more than adequate for smaller gatherings with a few friends. When reading the line, ‘His knife see Rustic-labour dight’ the host cuts the haggis open along its length, making sure they spill out some of the insides. A Burns Supper traditionally ends with the singing of Burns’ famous song about parting, Auld Lang Syne. Everyone joins hands in a large circle and sings the words together and at the line 'And here's a hand', you cross each of your hands over to rejoin those standing on either side of you. Today is Bubble Bath Day!